We're well into pumpkin season and you may be wondering how else to use this seasonal squash. I know some of my baking peers have used it in sourdough bread to good effect. So I set out to work out my own recipe from first principles. Well I'm delighted with the results I got. I roasted the pumpkin with some smoked chipotle chillies, coriander & fennel seeds and a little olive oil. The bread had the gorgeous nutty taste and chewy texture of sourdough with added floral lift of the seeds and background smoky warmth of the chillies. The bread is fantastic with cheeses, roast meat and salads. The recipe really isn't difficult and the results gorgeous. Go on give it a try. This recipe is enough to make two large loaves of about 800g each. Obviously, you can divide the dough up into different sizes. Rolls would be great for winter picnics with soup and cheese. The type and condition of the particular pumpkin or squash you use will affect the flavour and texture of the bread. Also, different pumpkins have different water contents, so you'll need to adjust the water content of the dough so that it is just right. So my water amounts below are a guideline only, don't worry, a bit different here or there won't make too much difference. The sourdough bread takes a while to make but it does not need much effort to do. The long time is needed to ensure that the full flavour and texture of the loaf develops. For those of you that don't want to do a sourdough loaf, I've put a 'yeast conversion' at the end. The yeasted loaf will taste quite different and I highly recommend you give the sourdough a go for the full flavour. You'll see from the picture that I included the pumpkin seeds from the pumpkin. I dry roasted these in a frying pan first and included them in the dough at the first fold. To be honest, some of them were a little fibrous, so I wouldn't do that again. If you wanted you could include 100g of sunflower or (juicy) pumpkin seeds dry roasted in a pan at the first fold. First you need to make your roasted pumpkin. This quantity will make more than you need for the bread. You can freeze what you don't use, add it to soups or curries, or use it as part of a ravioli stuffing. It's really not worth putting the oven on for less. I deliberately do not use salt to season as the required salt is added to the dough later. Heat an oven to 180-200°C with the shelf in the middle. Peel and cut the pumpkin or squash into approx 3cm chunks. Chop the dried chillies into small pieces. Crush the fennel and coriander seeds lightly in a mortar and pestle. You may find this easier to do if you dry roast them in a pan first. Mix the chillies and seeds thoroughly with the pumpkin or squash. Place on a baking sheet and drizzle with a little olive oil. Bake in the oven for 30-60 minutes until very tender turning to ensure even cooking. Mash or blend the cooked pumpkin or squash until you have a fine and fragrant puree. In a large mixing bowl, add the starter, flour(s) and roasted pumpkin. Mix well and add warm water gradually until you have a sticky dough. I know the dough is more difficult to handle sticky, be brave - it will get easier and your bread will be better wetter. Cover the dough with an oiled plastic bag or cling film for 20-30 minutes. Add the salt and mix thoroughly so it is well combined. Then give the dough a quick knead for 10 seconds. I do this by imagining the dough circle is a compass face with the 8 cardinal (N-E-S-W) and ordinal (NE-SE-SW-NW) points. So I call this a '10 Second Compass Knead'. Take a bit of the dough at N and bring it in to the middle of the dough. You may find it helps to do this with a damp hand or a hand with a little vegetable oil on it to prevent sticking. Do this in turn with the cardinal points. Then do this with the ordinal points. Turn the dough over and make it look a tidy round and pop it back in the bowl and cover with the oiled plastic. Leave for another 10 minutes in a warm place. Do the 10 Second Compass Knead again, cover and leave 10 minutes in a warm place. Do the 10 Second Compass Knead again and cover. So that's 3 10 Second Compass Kneads in total. You will have noticed the texture and stickiness of the dough has changed as it will continue to do so. Leave the dough for and hour and then do a letter fold in three twice like in the following video. Cover and leave for and hour. Divide the dough in two and roughly pat out into a rectangle, round or oval depending on what you want the final shape of the loaf to be: long, round or batard. Leave for 30 minutes covered in oiled plastic. Do final shape and put into proving baskets/bannetons or onto baking parchment and cover with oiled plastic and a tea towel. If you're using proving baskets/bannetons make sure that they and the tops of the loaves are well floured with either rye or rice flour. Using these flours will help make sure your dough does not stick. Normal flour tends to absorb more water and is much more likely to stick. Allow to prove for 1½ to 3 hours. This time really will depend on the temperature. What you are looking for is for the gases produced by the fermenting yeast to still have some power. When the loaf is first made, the dough is very resilient. If you press it with a finger it will push back and fill the dent. The longer you prove the less pronounced this effect is. Ideally, you will pop the loaf in the oven before the dough ceases to push back. You'll learn to judge the timing the more you bake. It's worth saying that with sourdough you will not get the dramatic 'doubling in size' you see in some other yeasted bread recipes. Look for a 25-50% increase. About 45 minutes before you bake, preheat your oven to highest setting. When you first start, judging this time won't be easy so err on the side of being early rather than late. Starting your loaf off in an oven that is not hot enough will not get you good results. If possible put a tray of boiling water on a lower tray below where bread will bake 10-15 mins before you start baking to create steam. When loaves are proved, slash the tops and pop in them in the oven and turn it to 230°°C. Bake for 15 minutes. Then take out the water tray and turn down the heat to 200°C and bake for another 30 minutes or so until you are happy it's baked right through. I baked my loaves for 50 minutes. Take the bread out of the oven and allow to cool on a rack. Enjoy! Do not add the 200g of sourdough starter. Use this set of ingredients. Mix all the ingredients in a bowl, including the salt. Then follow the Method above up to and including the 'Compass Kneads'. The leave to prove for 45 minutes. Divide and shape the dough and place on baking parchment or similar. Cover with a oiled plastic and leave until the dough had increased in size by about a half, about another 45 minutes. Bake as the method above. Carl Legge lives on the Llyn Peninsula in Wales on a permaculture smallholding and writes a regular blog full of delicious recipes and more. He is currently writing The Permaculture Kitchen, a book of seasonal, local, home-grown delicious recipes for Permanent Publications, the book publishing arm of Permaculture magazine. Stir-Up Sunday - here's our recipe for Christmas pud! While Dad's away, build a vegetable garden in a day! How grassroots resilience-building initiatives are responding to the world's current problems with sustainability, permaculture and transition. 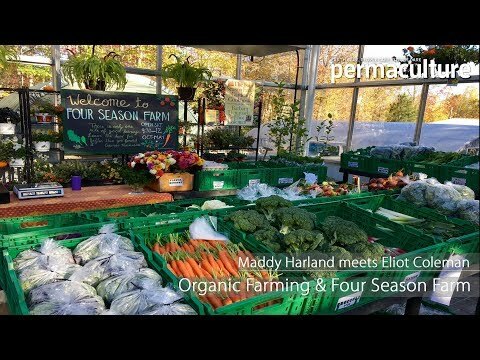 Permaculture teacher Patrick Whitefield reviews Anni Kelsey's guide on edible perennials and polycultures. The 'Permaculture Guide to Reed Beds' is, like all good guides, something you can trust as you venture forward on your quest to emulate the ethical foundation of Earth Care, People Care & Fair Shares upon which permaculture stands.